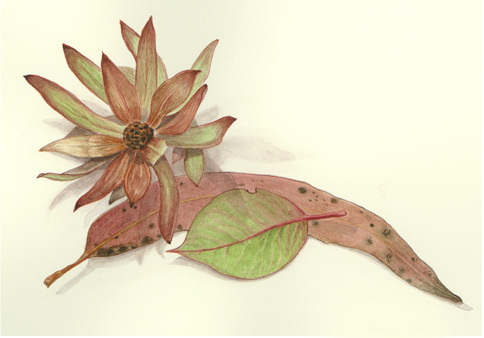 I first discovered botanical painting in 1995, in a class taught by Seattle’s Louise Smith. I was then accepted by the UCSanta Cruz’s post-grad Natural Science Illustration program in 1998 and spent an intense year in Santa Cruz learning various methods of science illustration, and deciding that the research and the art of science illustration really appealed to me. After an internship at the Royal Botanic Gardens at Kew, I returned to the US and began to build my freelance career while living in a decidedly rustic cabin in Indianola, Washington. Jobs ranged from magazine covers for Herb Companion to several children’s books featuring wolf cubs and young skunks; one of my favorite assignments was to illustrate a series of games, posters, and workbooks based on the Lewis and Clark expedition–I learned a lot about the journey and it offered the opportunity to paint a wide variety of animals, plants, people, and places. By 2006 I was shifting from freelancing to teaching, beginning with classes at the Center for Urban Horticulture in Seattle, and over the next few years adding classes in other venues; I currently teach at CUH, Gage Academy of Art in Seattle, the Winslow Art Center, as well as occasionally offering studio classes at my studio (no longer the rustic cabin!) in Indianola. Most recently, I’ve added an online class with Craftsy.com on beginning nature drawing. I’ve trimmed my teaching load back a bit to allow more time for my own painting, but plan to continue the classes into the foreseeable future, as they bring contact with some wonderful people and push me to learn and increase my own skills. I have wished to take your botanical drawing class for years and finally am retired and hope you will be offering it this spring in Winslow. My dear friends, Carole and Sid Mille,r have kept me in the loop with your schedule so I see that you may be at the Winslow Art Center again soon.